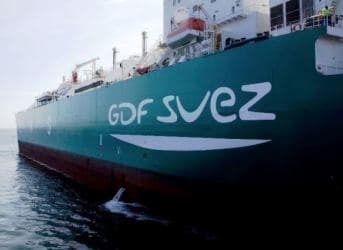 France’s GDF Suez (GSZ) has signed a 15-year agreement to build and operate the first-ever floating liquefied natural gas (LNG) import terminal in Uruguay, with operations scheduled to begin in the spring of 2015. The LNG terminal in the Montevideo Bay will be able to receive as much as 7.6 million cubic feet of natural gas from carriers, which will be reserved by national energy company Gas Sayago. It will also have a regasification capacity of 10 Msm3/day, expandable to 15 Msm3/day. GDF Suez will receive a US$7mn/month non-adjustable fee to build and operate fixed works, including a pier and boat berths, under the terms of the contract. The assets are to be paid within 15 years and transferred to Uruguay's government upon the close of the contract. Over a 20-year period GDF Suez will receive a US$5mn/month non-adjustable rental fee for the use of the 263,000m3 floating storage tank, as well as a US$2mn/month non-adjustable fee for regasification services, operation and maintenance of the facility. Uruguay itself uses just 300,000 cubic meters a day. GDF Suez won the contract to build the LNG terminal and regasification plant on 14 May. This is the first milestone in making Uruguay a regional energy exporter. The Montevideo plant is 150 kilometers from Buenos Aires, Argentina, where demand for electricity and natural gas is high. Currently, Uruguay can cover domestic demand most of the year with installed hydro, solar, and thermal power, though drought has a severe effect because most of its energy comes from hydroelectric dams. The national electric company, which already buys thermal energy from a number of small providers, is also seeking partners to add 200 MW in solar energy production and 500 MW from wind power projects for which the government will offer 25-year contracts. Although Uruguay is not a traditional destination for energy investors, its political and economic climate, along with its geographic position near energy-hungry Argentina and Brazil make it an excellent option for small-to-medium investors, and especially those with interest in renewable energy projects. This Week in Energy: Europe Doomed without Fracking?